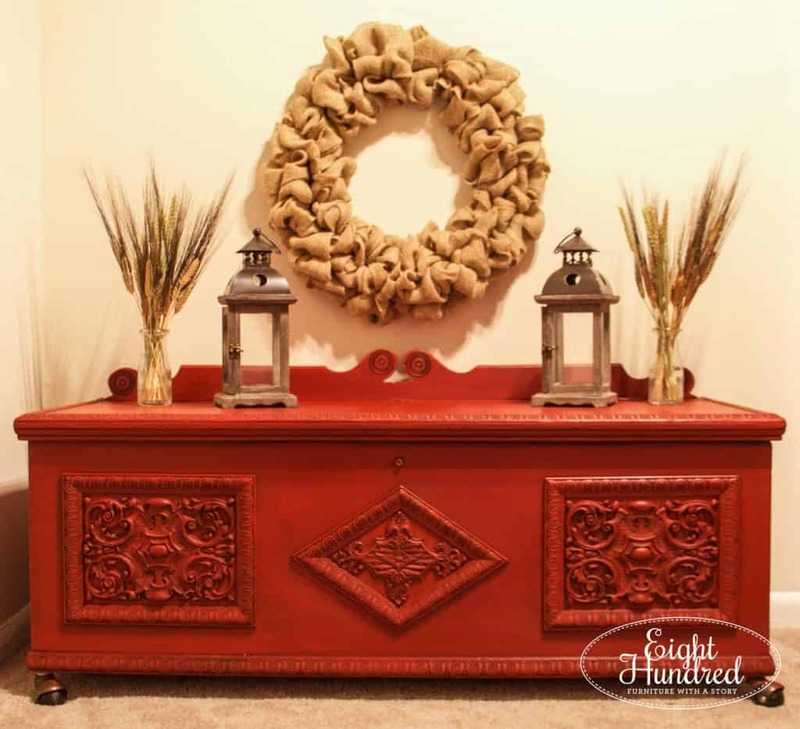 I’m convinced that red paint and dark brown wax are a perfectly dreamy combination this time of year. …but you’ll have to keep reading to see the “after” photo! 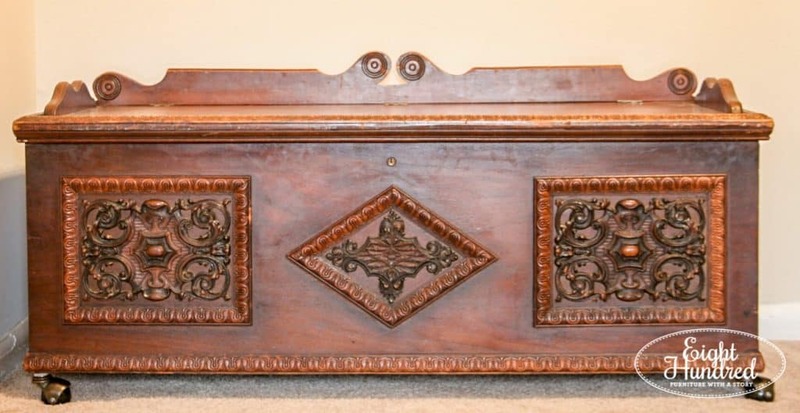 This pretty piece was yet another find on Craig’s List. 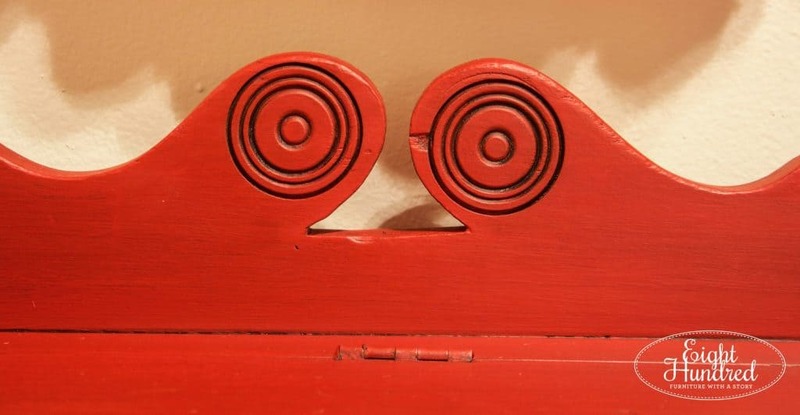 I got about 10 pieces of furniture from the same seller. It will probably go down as the best score of my life. 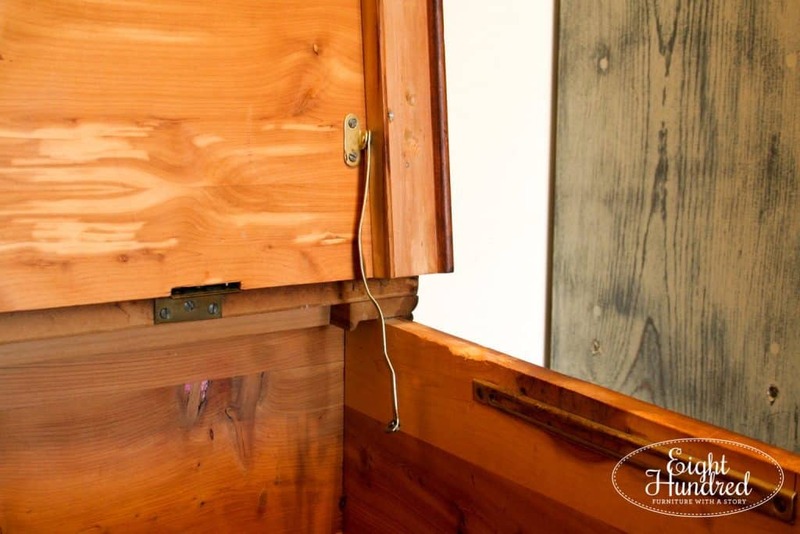 The wood inside of the chest was pristine. The only issue was with one of the latches. Since there was a good working latch on the other side, I simply removed this bent one. Poor thing. The maker’s label is by the latch. 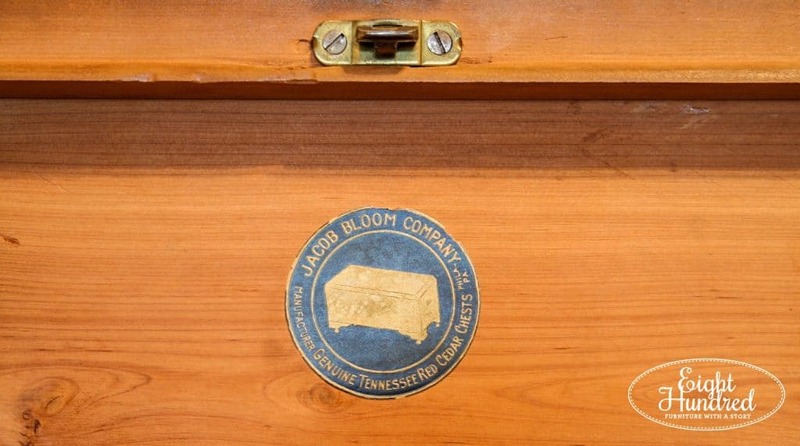 I did a quick internet search and didn’t come up with much on the Jacob Bloom Company. 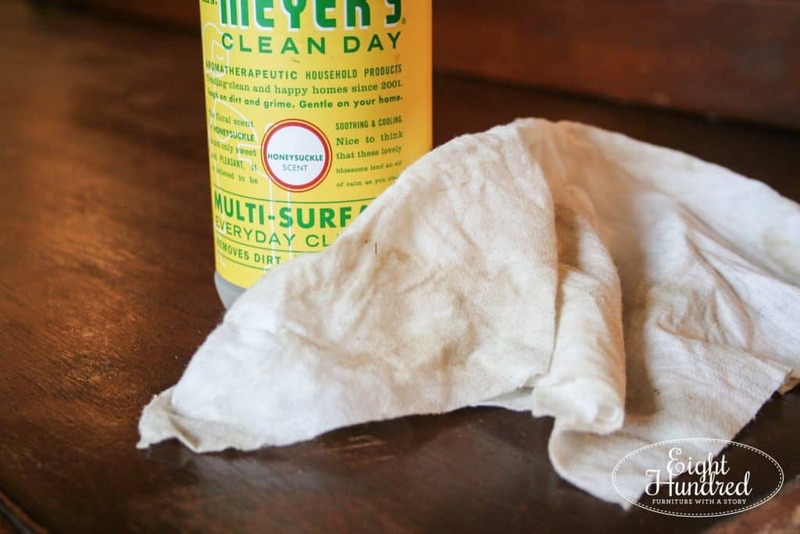 The previous owner had quite a few dogs and was a smoker, so I gave the chest a decent spray down with some of Mrs. Meyer’s spray. 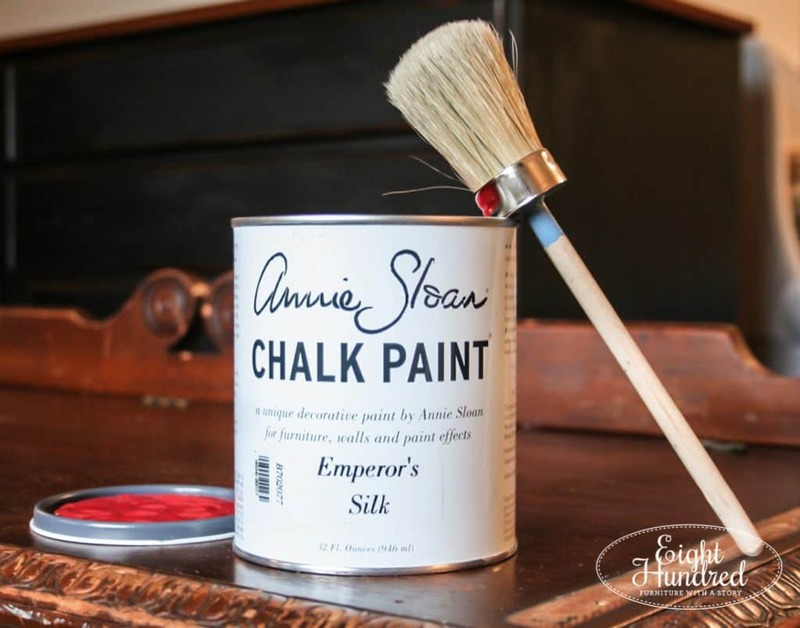 After a rub down, I cracked open my can of Annie Sloan’s Chalk Paint® in Emperor’s Silk. 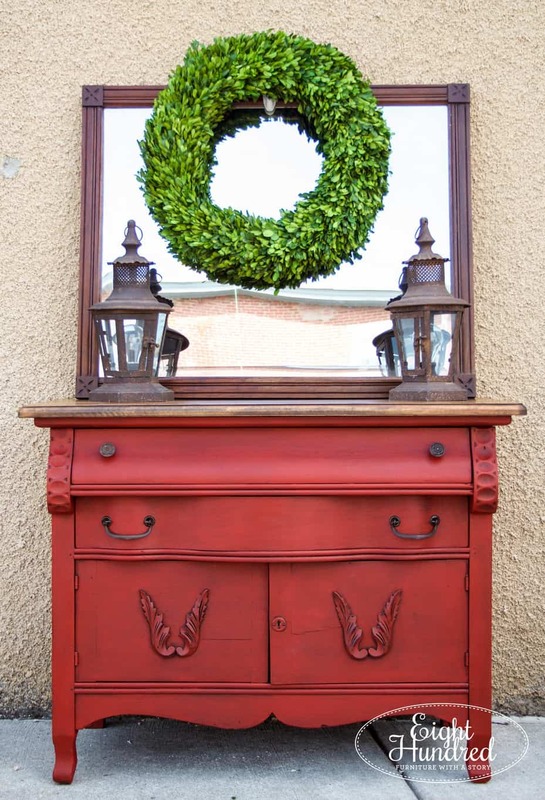 This is the same color I used on my oak washstand and it’s positively dreamy. After 2 coats, the chest was looking pretty good. I added a third to help cover the spots on the front by the triangle. See how they are a little bare? Next came a coat of Clear Soft Wax with my Annie Sloan wax brush. This little guy is a total game changer. 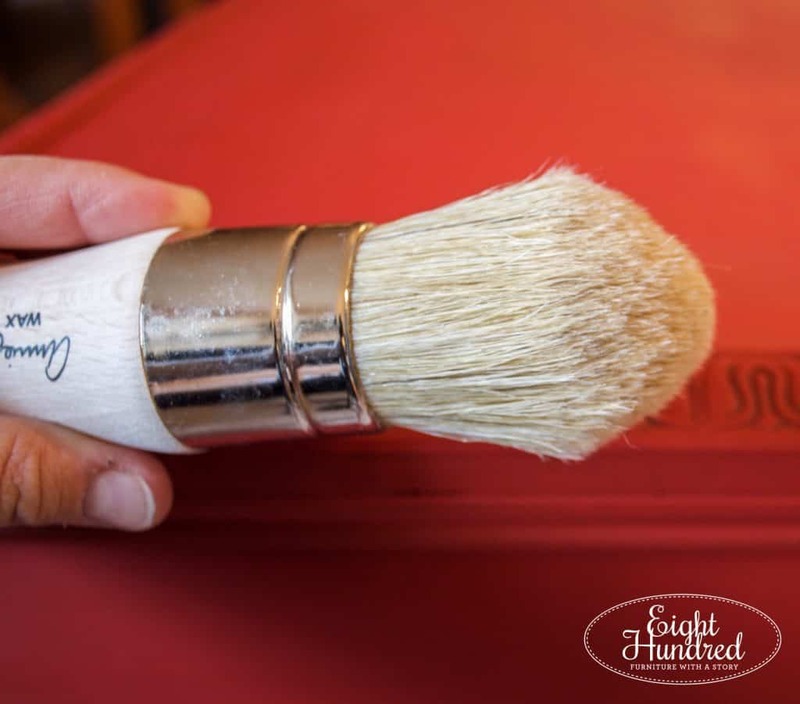 Believe the hype about Annie Sloan brushes. 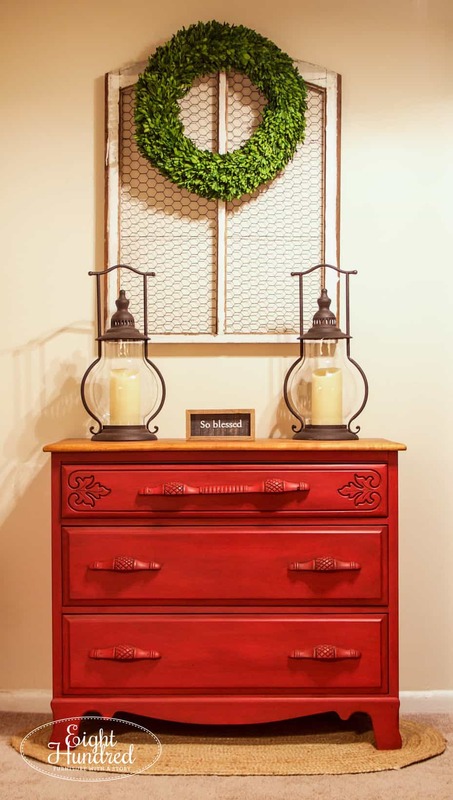 They really do make such a difference when it comes to using Chalk Paint®. 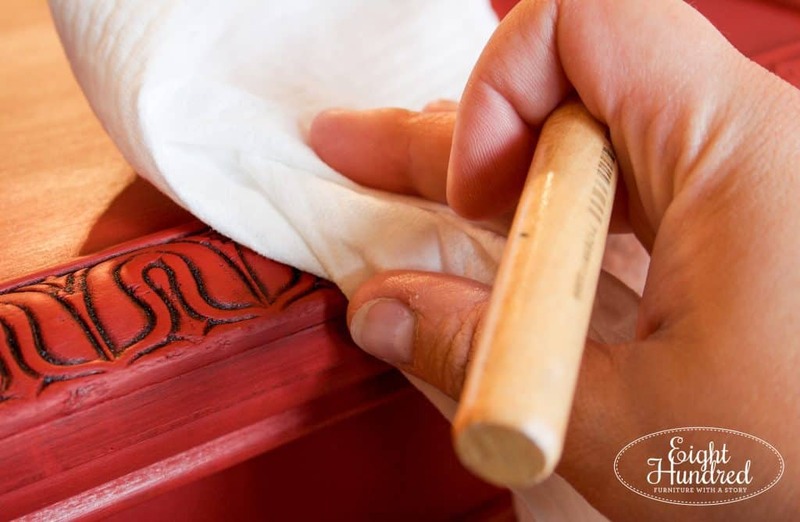 It took me a few years to realize this, but now I’ll never use another brush when I wax Chalk Paint®. 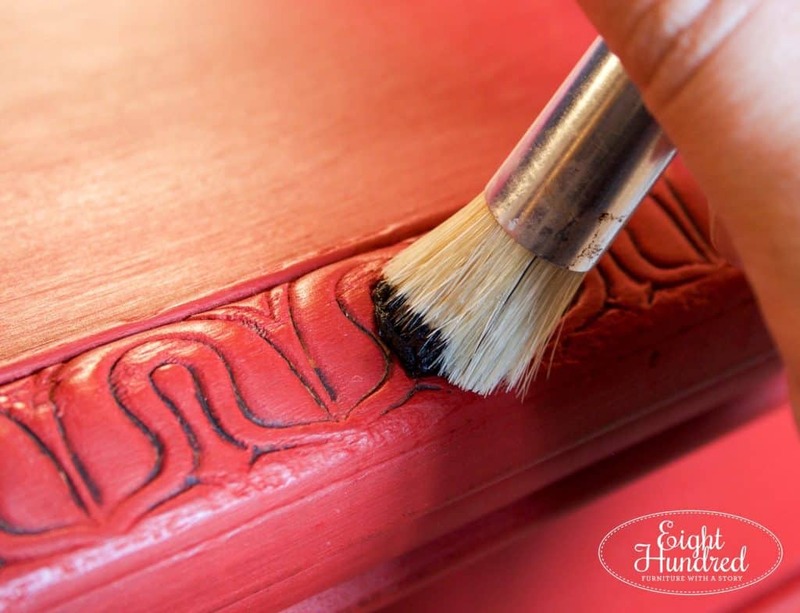 After a coat of Clear Soft Wax, I went in with a small brush and worked Dark Soft Wax into the carvings. Dark wax is a chocolaty brown color and compliments Emperor’s Silk like a champ. I gave the piece a good rub down to remove the excess Dark Soft Wax. 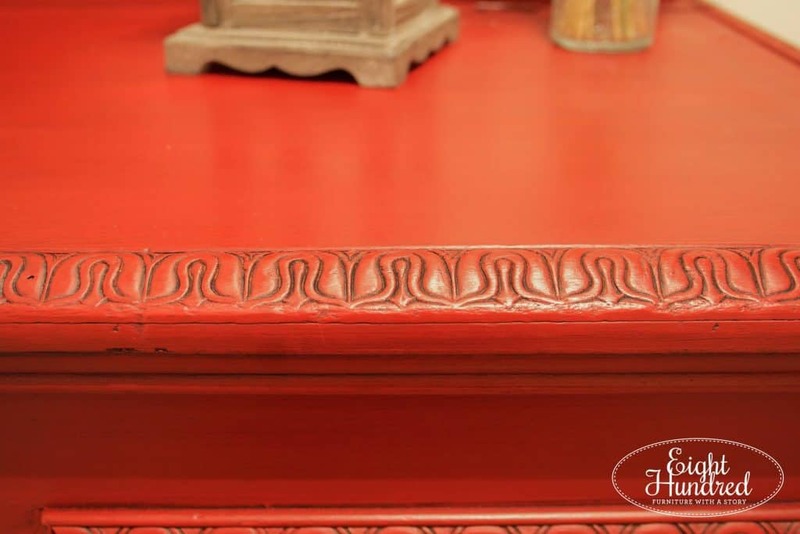 See how the Dark Soft Wax settled into the carvings so beautifully? Side note – I totally cracked up when I developed this photo. Don’t these look like eyes? 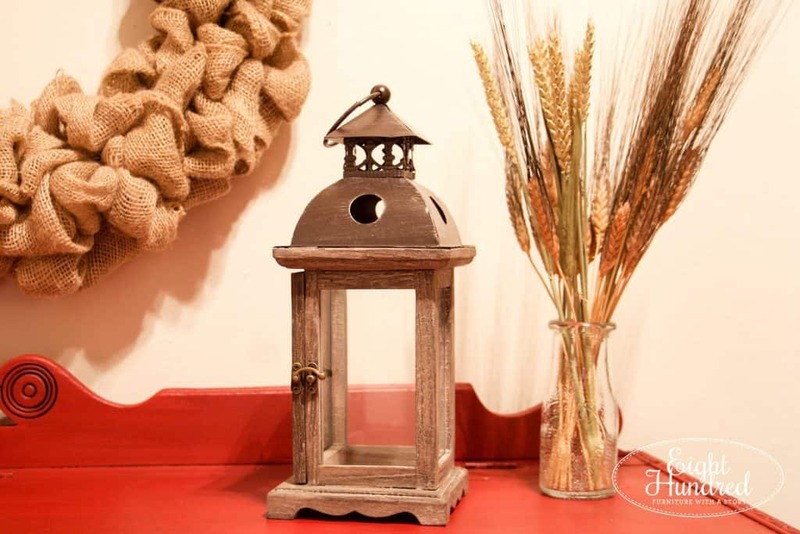 I really like the warm colors and fall-inspired pieces I picked for staging. My cat, Jake, had a total field day as I was snipping the wheat stems. It was all I could do to keep him from eating them. 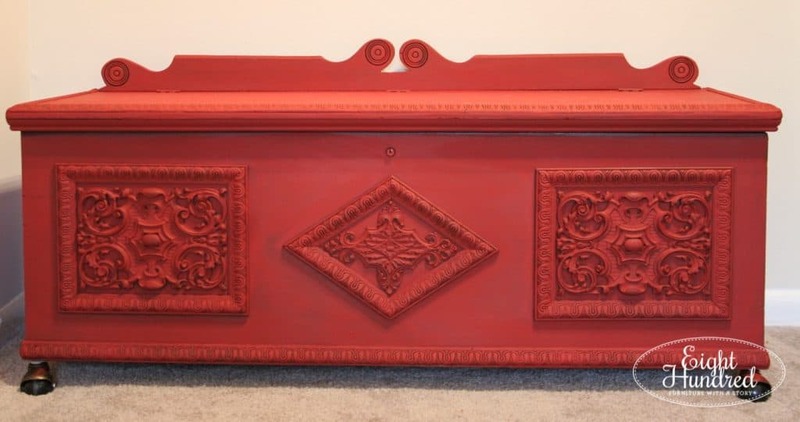 This lovely piece can be found at The Morgantown Market this weekend. Marc and I are going to deliver it along with another piece I finished, but you’re going to have to wait for that reveal!